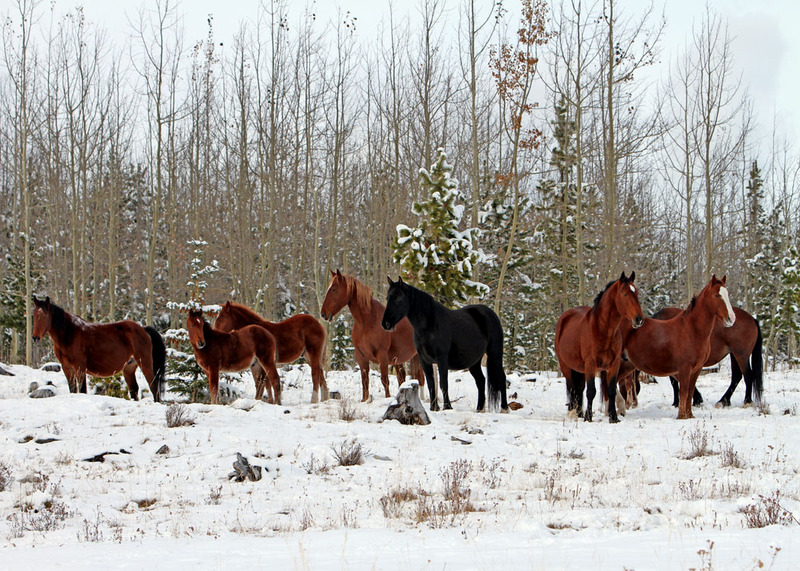 Winter seems to have made an early appearance here in Alberta this year, but in my travels thus far, the wild horses including the foals, all appear to be in excellent condition. There is plenty of forage for all the animals that winter in our Alberta foothills. Hopefully Mother Nature will not make the winter as harsh as some are predicting. Wild horses generally can endure the cold temperatures, but it is the deep snow that can inflict a toll on them and all other wildlife. The herds have already moved into their wintering areas, but with November being hunting season, they are skittish with the amount of vehicular traffic on the roads. By the end of the month things will quiet down and the horses will be able to settle into a more stable survival routine. 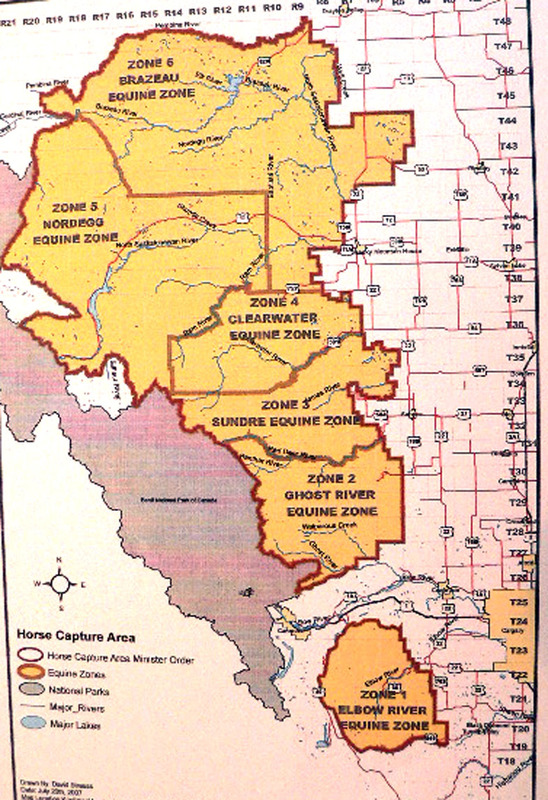 As you can see the amount of land this number of horses live in is immense. Therefore, WHOAS believes that taking into consideration last winter and spring where some herds had lost all their foals and some only have one left, there is almost no chance that the herds will have increased to a point where any more should have to be removed. Mother Nature has always proved to be the best management tool in regards to the wild horses. One only has to go back to the government’s own records for the period between 2000 to 2005 where their numbers stayed relatively stable. I want to concur with my colleague, Dr. Claudia Notzke’s statement that if ESRD does go ahead and issues permits this year we can only take it, despite their words to the contrary, that they wish to see the wild horses eradicated. It proves then that they are not considering the viewpoints and concerns of Albertans and are just listening to a select few self invested stakeholders who do not care for the wild horses. Therefore we encourage you to continue to write and email to the minister, Diana McQueen, stating your objections to any issuance of horse capture permits. 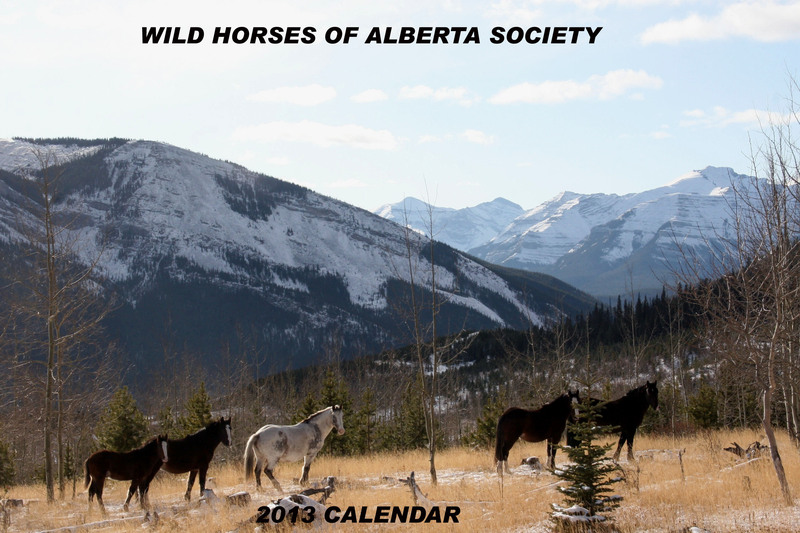 The 2013 calendars are now in stock and we have begun mailing them out. If you wish your copy or a perfect Christmas gift, send a cheque or money order made out to WHOAS for $25 which includes postage and handling. See the real beauty of our wild horses and the reasons for keeping and protecting them for all to see. My wife and I live in Edmonton, she was born and raised here I am a transplant from retirement from the Army. We both love horses and are always interested in viewing the Wild Horses of Alberta, we are both for capture and adopt by someone that wants a horse and who will look after it. We are waiting for spring and then plan to scout out these areas and take some pictures, nothing more beautiful than a horse running free on the plains. Alberta wastes alot of $$$ on nothing these extra $$$ could be used to preserve our horse life in Canada.